Stepper motors are devices, which convert electrical impulses into discrete mechanical rotational movements. 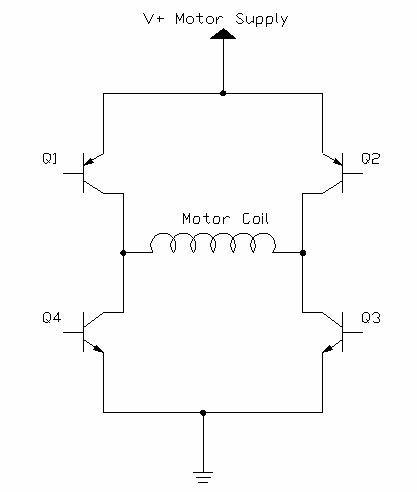 In a typical stepper motor, power is applied to two coils. Two stator cups formed around each of these coils, with pole pairs mechanically offset by &frac12; a pole pitch, become alternately energized North and South magnetic poles. Between the two stator-coil pairs the offset is &frac14; of a pole pitch. The permanent magnet rotor has the same number of pole pairs as the stator coil section. Interaction between the rotor and stator (opposite poles attracting and like poles repelling) causes the rotor to move &frac14; of a pole pitch per winding polarity change. Motors are available in either 2 coil (bipolar) or 4 coil (unipolar) windings. In the unipolar version, the coils are bifilar (two side by side wires) wound on each stator half and opposite ends of each pair are connected together to form a center tapped coil. With this method, the flux is reversed by powering either one end or the other of the bifilar coil pair with the center connected to common. For a bipolar motor, an external device referred to as an H-Bridge can be used to reverse the polarity of the winding and thus the flux. An H-Bridge can also drive a unipolar motor by not connecting the center tap (common) lead or using only one of the windings in the pair. Unipolar stepper motors require only 4 transistor switches which greatly simplifies the drive circuitry when compared to the 8 transistors required to drive a bipolar motor (dual H-Bridges). However, for unipolar stepper motors to have the same number of turns per winding as a bipolar motor, smaller diameter must be employed so that both windings may fit in the space of one. The resistance increases due to the smaller wire diameter. Due to increased resistance, unipolar stepper motors have 30% less torque at low step rates. At higher step rates, the torque outputs are approximately the same. In the chart above, + indicates the coil is conducting in the forward direction with one end being positive with respect to ground. The - indicates that the coil is conducting in the opposite direction. Continuing the sequence as outlined above causes the rotor to rotate in a forward direction. Reversing this sequence causes the motor to rotate in the reverse direction. The coils only are required to be energized long enough for the rotor to move to its' next position. If the coil remains energized, it will lock the shaft of the motor and this situation is commonly used for stopping or putting on the brakes. The torque developed in this manner is referred to as the motor's holding torque. Operated at a fixed frequency, the electrical input to the motor appears as a two-phase 90-degree shifted square wave. The no load or constant load accuracy of a 7.5 degree/step motor is within 0.5% noncumulative. This means that the positioning error is always the same whether the rotational movement is one step or 1000 steps. Since the step error is noncumulative, it averages itself out to zero within a 4-step sequence, which corresponds to 360 electrical degrees. The 4-step sequence uses the same coil, magnetic polarity and flux path. With this in mind, the most accurate method of positioning would be obtained by stepping in multiples of 4. The drawing below depicts a simple H-Bridge. It consists of two pairs of transistors connected to each end of the motor coil. Q1 and Q2 are connected to the positive motor supply source. Q3 and Q4 are connected to ground. By putting a positive voltage on the base of one of the transistors, it will cause the transistor collector/emitter junction to conduct. By switching transistors Q1 and Q3 on, it will cause current to flow through the motor coil in the forward or + direction. By switching Q2 and Q4 on, it causes current to flow through the motor coil in the reverse or - direction. The logic controlling which transistors are switched must be quite precise as switching transistors Q1 and Q4 or Q2 and Q3 on at the same time will result in shorting the power supply directly to ground which will destroy the transistor pair and possibly the power supply as well. Logic must be provided to inhibit any programming error, which would result in switching the wrong transistors on at the incorrect time. Additionally, timing circuitry should be employed that the correct transistors are switched on only after the others are switched off. Simply driving the H-Bridge directly from a microcontroller would be ill advised. On power-up, the outputs of many microcontrollers go high momentarily which would instantly destroy an H-Bridge without the proper inhibit circuitry for disallowed conditions. Whenever an inductor is energized, higher than normal current is drawn while the magnetic field of the coil builds. Conversely, when the inductor is de-energized, the magnetic field in the coil collapses causing a voltage to be induced in the inductor and current to flow in the opposite direction. The reverse current flow may damage the switching transistors in the circuit. In order to correct the problem with the polarity reversal caused by the falling magnetic field inducing a current in the inductor, snubber diodes are installed. The direction of the diodes is such that during normal operation, the diodes do not conduct. When the falling magnetic field causes reverse current flow, the diodes conduct this current directly to ground and away from the switching transistors. The circuit below depicts a simple H-Bridge with snubber diodes installed. Referring back to the Wave Drive table for half stepping our motor and also the UDN2998 truth table, we can make up a logic table depicting the output for our microcontroller. This table is shown below. You can obtain a complete data sheet at www.allegro.com that provides more information about temperature, heat sinking and other modes of operation such as the chopper mode. 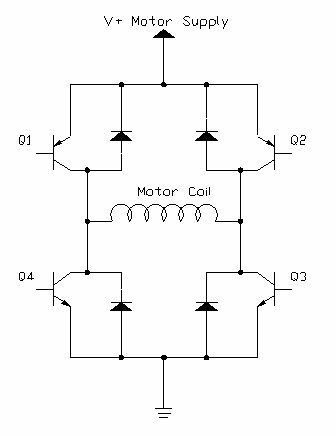 The following schematic diagram shows a circuit, which places what we have discussed into practice. I am using a 16F84 microcontroller in this example, however, any microcontroller which is supported by JAL will work. You will only need to make a few changes in both the circuit and the program to accommodate the changes. Power for the circuit comes from one or two external power supplies. Operating off a single supply is a bit trickier due to the noise generated by the switching transistors. The 5 volt supply for the microcontroller should be well regulated. It is very important not to omit the two 0.1 uF capacitors shown and they should be placed as close as possible to their respective chips. These are decoupling capacitors and if omitted can cause unreliable operation or the circuit not to function at all. I experienced lack of function without these capacitors when operating from the same power supply and even including a 5 volt regulator for the microcontroller. Power for the motor should be based on the current and torque requirements for the motor and what kind of load the motor must move. A little experimentation may be in order to find just the right value for the motor supply voltage. Increasing the voltage will increase the motor current and the torque produced while at the same time increasing the heat produced by the UDN2998. You will notice both a 10 K and a 50 Ohm resistor connected to the reset lead of the microcontroller. You might be able to omit the 50 Ohm resistor. The 10 K resistor pulls the reset lead up to the 5 volt supply, without it, the microcontroller will remain in the reset mode and the circuit will not operate. The 50 ohm resistor is included as recommended by Microchip Technologies in order to prevent the reset pin from going negative when the reset switch is pressed. The UDN2998 is not the only H-Bridge that is manufactured by Allegro or by other manufacturers. You might select a different chip based on your project requirements. Pins 5 and 8 of the UDN2998 are the ground returns for each side of the H-Bridge. If necessary, you could install current limiting or current sensing resistors at this point. Beware of the wattage rating of any resistors installed here as a motor drawing several Amps at even 12 Volts will require a resistor of considerable wattage to prevent it from burning up. 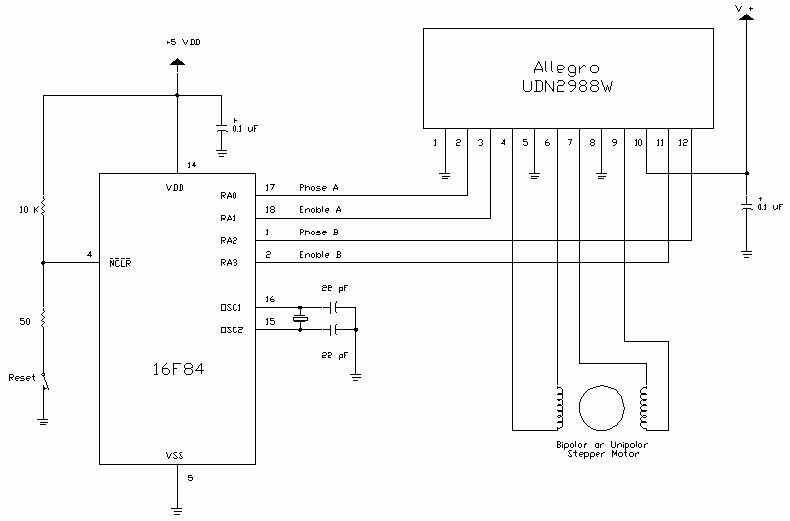 Following is the JAL library that you will need to include in your program to drive a stepper motor using this configuration. -- version 2 of the License, or (at your option) any later version. -- Library General Public License for more details. where direction is either true for forward or false for reverse and speed is the number of milliseconds between steps. where direction and speed are exactly the same as for full stepping and seq is the sequence counter used to keep track of which half step to take. Following is a demonstration program that utilizes bipolib.jal and exercises the stepper motor to prove functionality of the circuit and library. I believe the demonstration is self-explanatory. I encourage you to experiment with the demonstration program to get a feel of how it operates. I welcome your comments and would be pleased to learn of any projects you have done which utilize the information, circuits, library or demonstration program contained here. Well, JAL is Just Another Language. Look at Steppers for general information.